"The History of Diners in New Jersey" April 2015 Book Giveaway ~ The History Girl! 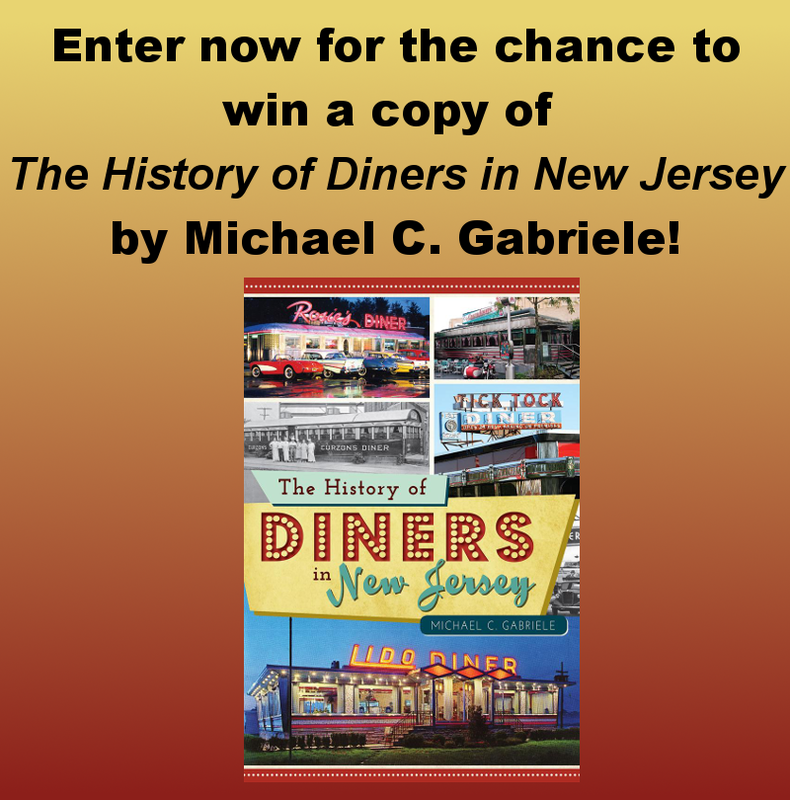 Thanks to author Michael C. Gabriele, The History Girl is offering a signed copy of his book The History of Diners in New Jersey. In order to be in the running, submit your name and e-mail address below! The silver Airstreams and neon signs of the classic American diner brighten New Jersey's highways and Main Streets. But the intrinsic role they have played in the state's culture and industry for more than one hundred years is much more than eggs-over-easy and coffee. Diners are the state's ultimate gathering places--at any moment, high school students, CEOs, construction workers and tourists might be found at a counter chatting with the waitresses and line cooks. Jerseyans yearn for lost favorites like the Excellent Diner and Prout's Diner and still gather at beloved haunts like the Bendix and Tick Tock Diners. Although the industry is all but gone today, New Jersey was once the hub of diner manufacturing, making mobile eateries that fed hungry Americans as far away as the West Coast. Author Michael C. Gabriele offers this delicious history - collected from interviews with owners, patrons and experts - and indulges in many fond memories of New Jersey diners. Rules *One entry per person. *Valid for all residents of the 50 United States of America, 13 years of age or older. *Entries without a valid e-mail address are not eligible. *Contest begins April 12, 2015 at 6:00 pm EST and ends April 18, 2015 at 8:00 pm EST. *The winner will be chosen at random. *The winner will be notified via e-mail on April 18, 2015 after 8:00 pm. The winner must respond with a mailing address within thirty-six (36) hours or another winner will be chosen.